at the bank of computers he uses in his work. Astronomers working atop Mauna Kea are getting customized weather forecasts to make the best use of their premier observing site. They have their own weatherman -- meteorologist Richard Knabb, who issues forecasts specifically for the 13,600-foot-high observatories. Knabb is a University of Hawaii Institute For Astronomy faculty member with an office in the meteorology department. It is located across from the National Weather Service in the Institute of Geophysics and Planetology on the Manoa campus. His position, straddling the two sciences, is believed to be unique. "I'm not aware of any other specific collaborations between meteorology and astronomy departments," he said. In the past, said astronomer Richard Wainscoat, "We tried to work out what was going to happen ourselves." The National Weather Service tried to help, he said, "but it's not their expertise to provide forecasts at that altitude, at that location." Meteorologist Steven Businger, principal investigator for the astronomy weather program under an Astronomy Institute grant, said he wrote a proposal for it in 1997. Businger, whose specialty is weather forecasting, suggested a custom forecasting operation could be developed for astronomers with powerful new computer technology and sophisticated high-resolution numerical weather-prediction models. It took two years to develop and sell the program to those involved, but all the observatories are supporting the effort and benefiting from it, he said. Knabb said he worked on cirrus cloud plumes over Hawaii and the Pacific Ocean for his doctorate degree in meteorology from Florida State University. "Since cloud bands of that type tend to get in the way of astronomy at Mauna Kea, they (at UH) were interested in my background in that respect," he said. He also ran numerical models to forecast the weather, he said. 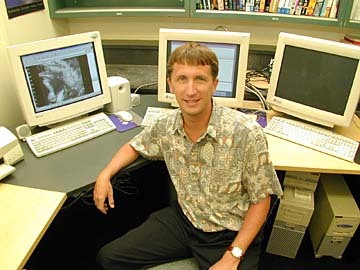 He joined the Astronomy Institute in January 1999, and issued the first Mauna Kea forecast. He covers basic weather -- winds, temperature, moisture content, cloud coverage and even storms. "It does snow on Mauna Kea occasionally," he pointed out. "What's really, really neat about this," Knabb said, "is not just the collaboration but an incredible computer source from Subaru." He's using the supercomputer managed by Ryusuki Ogasawara at Subaru Telescope's Hilo facility to run numerical weather predictions for Mauna Kea. He said he's continually improving the forecasts and is close to issuing them daily. "It's a research endeavor," he said. "On most nights when it is clear, there is still a lot of variability in turbulence -- the wind and temperature profile above the summit -- which affects the astronomical observing quality (called "seeing. ')," Knabb said. "There are certain variables we can compute and give to the astronomers in advance so they can adjust their observing schedule." Wainscoat, Knabb's main Astronomy Institute contact, said astronomers are dependent on the weather so the forecasts have been very valuable to everyone. It will be even more important in the future, Wainscoat said, "because some telescopes are going to exchange instruments depending on weather conditions." For example, infrared astronomy can be done in a very dry period, or astronomers may choose to do imaging if conditions are very stable, he said. Before Knabb's forecasts, Gemini Telescope astronomer Doug Simons said astronomers basically were "winging it" for research operations costing about $30,000 a night on major telescopes. He said the National Science Foundation, which is funding Gemini, "is interested in getting the most scientific bang for the buck. The way we do it through Gemini is to coordinate observations with state-of-the-art forecasting." Simons, who earned his doctorate degree at the Institute for Astronomy, said the 8.1-meter Gemini Telescope, opening in August, particularly needs very precise weather forecasts. "We have a whole variety of programs that we can execute on any given night. It's all a function of what the weather is going to be." Ideally, Simons said, the temperature in the dome should be the same as it is outside to eliminate turbulence. "We can preset temperature in the dome to what Rick forecasts so when we open the dome, everything is at the proper temperature." 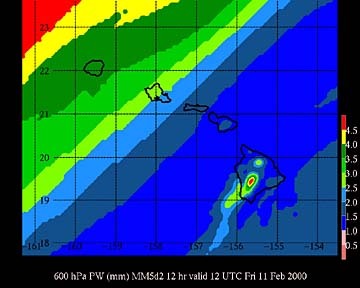 Having Knabb post daily, detailed forecasts on a Web page (http://hokukea.soest.hawaii.edu/) is a huge advance, Simons said. He said they're fortunate to have use of the Subaru computer: It's been "a very successful joint effort" by all those concerned. University of Hawaii meteorologists using the Subaru Telescope's supercomputer in Hilo to predict weather conditions on Mauna Kea have an advantage over meteorologists across America. The National Center for Atmospheric Sciences in Boulder, Colo., tried to purchase a computer as powerful as Subaru's, said UH meteorologist Steven Businger. "So all the meteorologists in America were very disappointed because we didn't have access to the fastest supercomputers coming out of Japan," Businger said. "We were seeing the European community buying Japanese supercomputers and getting ahead of Americans in supercomputing power." There is rivalry as to whose weather models are best, and a lot of it has to do with supercomputing power, Businger said. The Subaru supercomputer, being used to run forecast models for Mauna Kea astronomers, is more powerful than one being used in Washington, D.C., he said. The National Science Foundation, which funds the National Center for Atmospheric Sciences, also supports big new telescopes on Mauna Kea, such as the Gemini Telescope, he noted. "It is ironic that the Japanese supercomputer is supporting an NSF project in Hawaii where NSF couldn't buy one for themselves," he said.